The first innings of South Africa was squeezed for 249 and they managed 232 in the second. Pakistan amassed 442 runs in their first innings and chased the easy target of 40 runs by scoring 45 in 13.5 overs for the loss of three wickets. Khurram Manzoor (Pakistan) was announced ‘Player of the match’ for his superb knock 146 in the first innings. The fourth day’s play came to an end on Thursday, October 17, 2013, at Sheikh Zayed Stadium, Abu Dhabi. Earlier, the Proteas started the day at 4-72 after 26 overs whereas AB de Villiers and Dale Steyn were batting at 11 and 0. They had a quite beginning and added 24 runs in the following eight overs with just one four. The first hundred of the innings appeared on board in the next one with a boundary from de Villiers and Dale Steyn was clean bowled by Zulfiqar Babar four runs later for 7 off 49 balls. 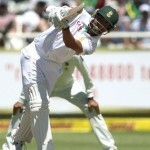 Jean-Paul Duminy was declared leg before wicket off Junaid Khan for a duck and was replaced by Faf du Plessis. The batsmen found it hard to score the runs freely and adapted the defensive tactics while the score was taken to 6-121 after 50 overs. AB de Villiers attained his 33rd Test fifty in the 54th over with a big six over the bowler’s head and du Plessis was caught and bowled by Saeed Ajmal for 9 off 55 as the total touched 133 in 56.6 overs. Robin Peterson walked in next whereas his senior partner kept on creeping at the other end with occasional boundaries. The skipper of Pakistan, Misbah-ul-Haq made few changes in the bowling for getting the breakthrough but remained unsuccessful. The fifty runs partnership was witnessed on the first ball of the 68th over and the association was extended to 190 when AB de Villiers was caught by Shan Masood at cover off Junaid Khan for 90 from 157 deliveries with 1 six and 7 fours. Robin Peterson decided to accumulate as many runs as possible to give some task for the hosts and the new batsman, Vernon Philander, assisted him well at the other end. The innings defeat was averted when Petersen took a single on the first ball of the 73rd over and the score crossed the 193 runs mark. 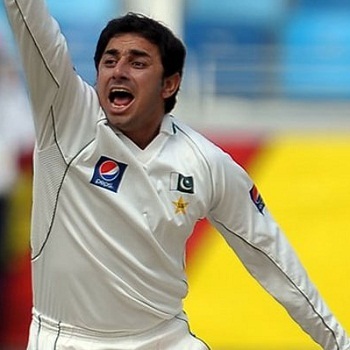 Saeed Ajmal got the last two wickets in the 83rd over by removing Philander and Morne Morkel for 10 and 0 runs. Robin Peterson secured his end for 47 off 67 with 3 fours as South Africa was bowled out in their second innings for 232 after 82.4 overs. Saeed Ajmal was the star performer with four wickets, Junaid Khan held three, Zulfiqar Babar got two whereas Mohammad Irfan chipped in with one wicket. Pakistan required just 40 runs to win the game but faced an early shock when the speedsters of the Proteas flew away with their three top order batsmen for seven mere runs. Shan Masood, Azhar Ali and Khurram Manzoor surrendered for 0, 3 and 4 runs. The experienced duo of Younis Khan along with Misbah-ul-Haq got together in the center and tried to make life easy for the home side. 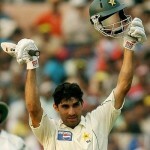 They added 1 six and 3 fours in the coming overs while Misbah-ul-Haq dispatched the winning six on the fifth ball of the 14th one. 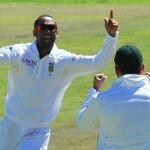 Vernon Philander was the top wicket taker with two and Dale Steyn got one. Pakistan grabbed the first Test with a wide margin of seven wickets and leads the two match series 1-0. The second and final game will commence from October 23, 2013, at Dubai International Cricket Stadium.